Originally known as Madhopur, Sawai Madhopur is a beautiful and legendary city of the desert state of India. Rajasthan is full of places that boast about India’s glorious past and this city of Madhopur holds an important place in it. There are a number of forts and temples in this city. Even the surroundings of the city are full of ruins of historical monuments. The Ranthambore Fort, the Chamatkar temple, the Khandar Fort and the Ganesha Temple are just a few of these popular spot. This city is also close to the famous Ranthambore National Park that houses a variety of wild birds as well as animals. This city has been a very popular spot among the curious people interested in the glorious history of India as well as among the wildlife lovers. Listed below are some of the most visited places of Sawai Madhopur. 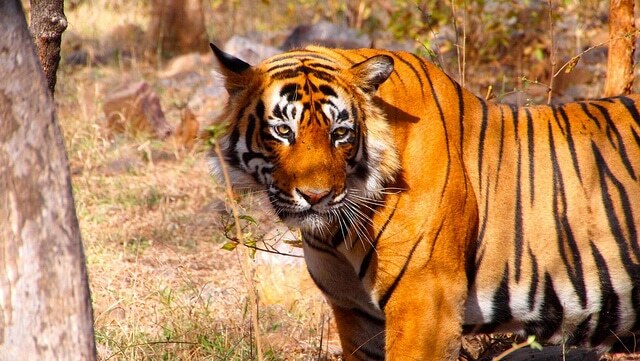 The Ranthambore National Park is one of the most famous wildlife parks in north India. It is located at an 11 km distance from the main city. This park has a large number of tigers. The authorities take good care of the tigers and create a healthy environment for them to breed in. This endangered specie is the main attraction of the National Park. It also houses many other species of animals and birds like nilgai, sloth bears, hyena, chital, wild boars and so on. People can go through this park by availing the safari offered here. The park also encompasses three beautiful lakes, namely, Raj Bagh Talab, Malik Talab and Padam Talab. This temple is one of the most important temples in Jain religion. A series of miracles brought this temple into existence and therefore, it was named the Chamatkar Temple. Legend has it that a farmer once got a dream in which God asked him to dig up his field at a said point. When the farmer did that, he found the idol and handed it over to the Digambara sect of the Jain community. That wasn’t the end of the miracles. The same farmer got another dream in which the God asked him to leave the idol in a carriage and see how far the horse goes. A temple must be built right where the horse stops. The horse stopped near this city and that’s how the temple was built. The Chauth Mata Temple is another beautiful and legendary temple situated at a distance of 35 km from the city. It is said that the idol of this temple was brought by Maharaja Bhim Singh from Bharwada. He placed the idol at the hill top and that’s where the temple stands now. This shrine was built in the Rajput style of architecture using white marbles. It attracts a large number of devotees. Apart from Chauth Mata, the temple also has beautiful idols of Lord Ganesha and Lord Bhairav. A grand celebration takes place here during the time of Ganesh Chaturthi. The Ranthambore Fort is said to be one of the oldest forts in Rajasthan. It was built by the Chauchans in the 8th century. This fort now lies within the Ranthambore National Park. After the defeat of the Chauhans, this fort was ruled by a number of kings. According to history, it has also been attacked over and over again by different kings like Bahadur Shah, Feroz Shah Tuglaq, Qutub-ud-din and Allaudin Khilji. The grand Toran Dwar, a beautiful 32-Pillared Chhatri, Mahadeo Chhatri and Sameton Ki Haveli are some of the important places of the fort. Khandar Fort is located at a distance of 40 km from the main city of Sawai Madhopur. The King who built this fort was famous for never having lost a battle. The damaged walls and structures speak of the attacks that took place here. 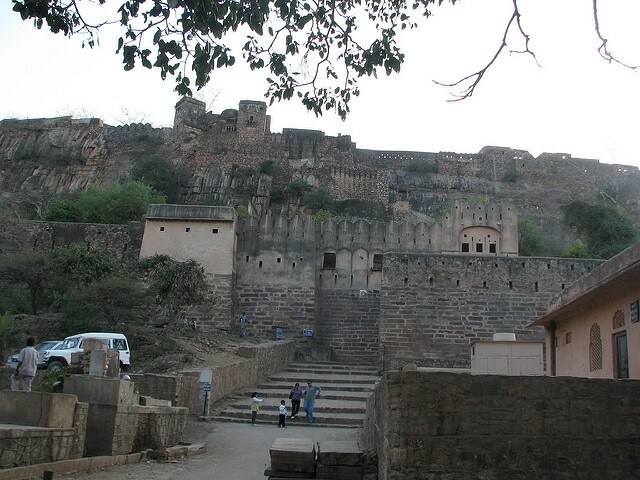 The fort has had many rulers, starting from the Sisodia kings of Mewar to the Mughals to the Maharajas of Jaipur. The seven temples within this fort are what make it so popular. It has a Hanuman temple, Jain temple, Rani temple, Chaturbhuja temple, Jagatpalji temple, Jayanti Mata temple and Govind Devji temple. Each of these temples are popular for something or the other. This fort is a must visit place for the same vicinity will speak to you about many different stories and incidents. The city experiences tropical climate. The summers are usually very hot but people interested in architecture visit the city during this time to see the best of everything. However, if focusing on the architecture is not your prime motive, we would suggest you to visit Sawai Madhopur between the months of October and March when you would enjoy exploring the city without the heat bothering you.